The Backyard Burger Grill Off was held downtown at Discovery Green and was designed to find Houston’s best burger, something I know a thing or two about. For $40, patrons could taste all-you-could-eat sliders from some of Houston’s best restaurants with all the necessary accoutrements, and unlimited as-much-as-y0u-could-stomach beer from some of Houston’s best breweries. 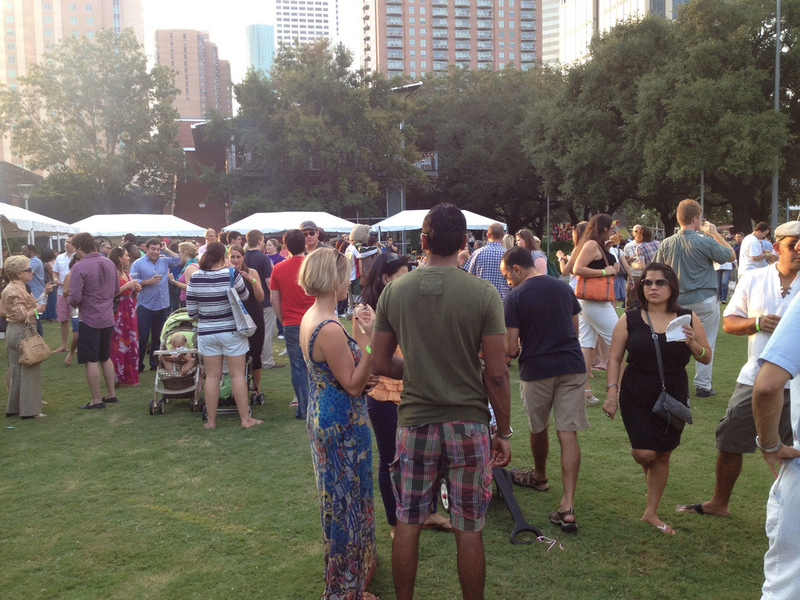 Discovery Green was bustling, mostly with parents trying to get their children to run like the wind so they wouldn’t be up all hours of the night, but also with a hip and hungry Houston crowd ready to decide the proprietor of our fair city’s best burger. The first stop was the Southern Star Brewery table where we kicked things off with a big (plastic) glass of Bombshell Blonde. Not only do I love the cheery blue label complete with a blonde bombshell on it, I actually really love the beer. It’s a not-hoppy American Blonde Ale that is perfect for a hot Houston day. We paired this with the Tasting Room’s Corn Maque Choux and their slider topped with shredded pork. As much as I love The Tasting Room, I was disappointed with their slider; it was bland and, if a burger can even be this, kind of meeley. The corn maque choux was decent, but wasn’t life-changing by any means. The next stop was the Saint Arnold Brewery table for some Santo. I am nothing if not a die-hard Saint Arnold’s fan, so when I saw they were serving Santo, I made a bee-line. You just cannot go wrong swilling anything from Saint Arnold’s and I may or may not have loitered around their table far longer than a properly lady should have. 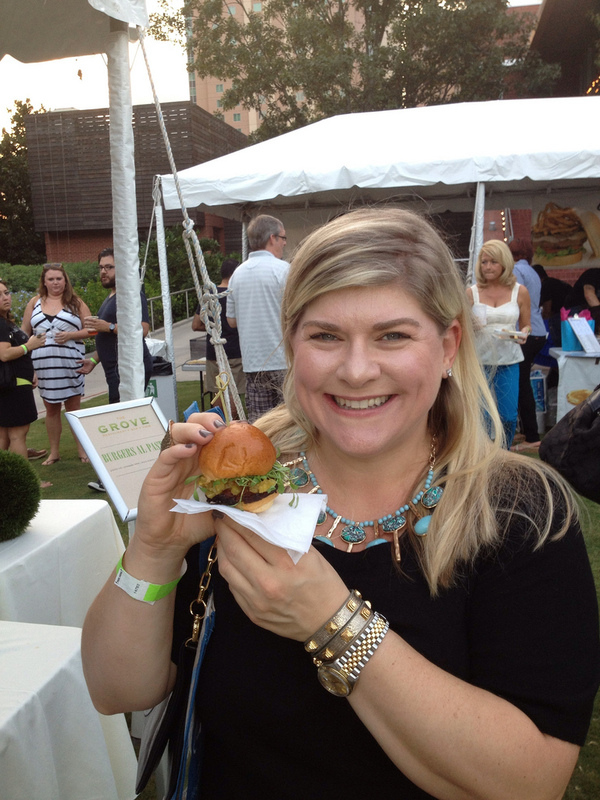 The other burgers we had were from J. Black’s (which was great); Roots Bistro (meh); BRIO (decent); Vic & Anthony’s (really good); and The Grove (who won my “pink marble” for best slider of the night). As far as the beer was concerned, I liked the Weisse Verse from No Label and the Oktoberfest from Saint Arnold; however, I especially loved the Leprechaun Dry Cider! As adventurous an eater as I am, I have never tried a hard cider before last night and I absolutely loved it! It tasted like a cross between beer and champagne and, really, what could be better than that? As I always say, the only pain is champagne and combined with beer makes it just that much better. 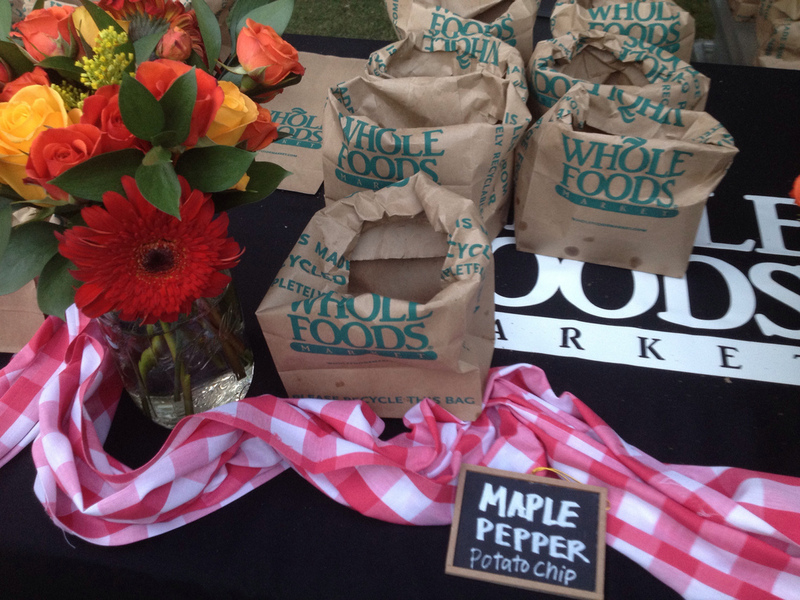 As a side note, Whole Foods was serving their homemade potato chips (Vanilla Pepper! Maple Pepper! BBQ!) that I didn’t even know they made, and grilled ancho-chile pineapple. Pure deliciousness! The winners of the best burger turned out to be a tie between J. Black and The Grove, although if I’d have known that they were going to close the voting at 7:30, I’m pretty sure I would have been the deciding voter. Silly swing voters. The only downfall of the event was that they didn’t have any water — not even to buy. In fact, they had nothing at all to drink except beer. I get that it was a beer-sponsored thing, but it was about 100 degrees with the humidity and I would have paid $1,000 for a bottle of water. I must have looked really desperate at The Counter‘s table because they actually gave me one of their bottles from their own stash. Sweet y’all, so sweet. All in all, the 1st Annual Backyard Burger Grill Off was a fantastic event. Being there with such great friends in a place I don’t normally go in Houston and finally being able to be outside after a brutal Summer made everything all right. 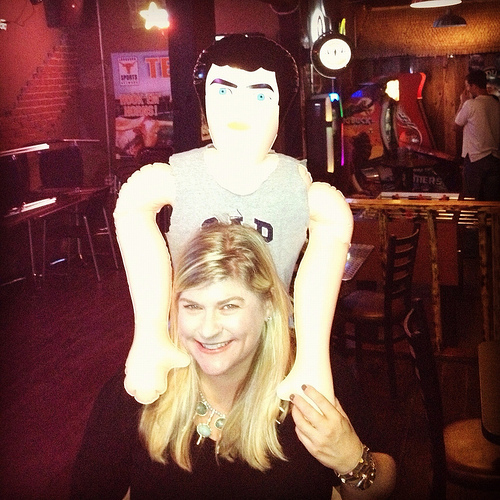 The post script of this story is that we went to The Railyard when a group of people more senior than us came in celebrating a birthday and carrying a blow up doll. That is certainly not something you see every day and, let’s just say I developed a bit of an affinity for this young, plastic man. He was handsome with big blue yes, trim, polite, and quiet, although a bit shoddily dressed. We snapped a picture and swilled a beer together, and it was actually the best date I’ve had in a long, long time.